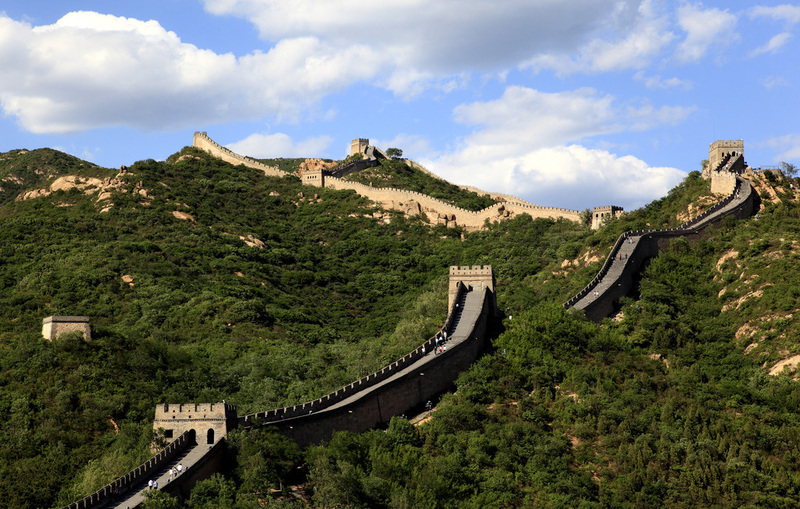 Great Wall of China, Great Wall Guide, Great Wall Travel Tips, Great Wall Information. 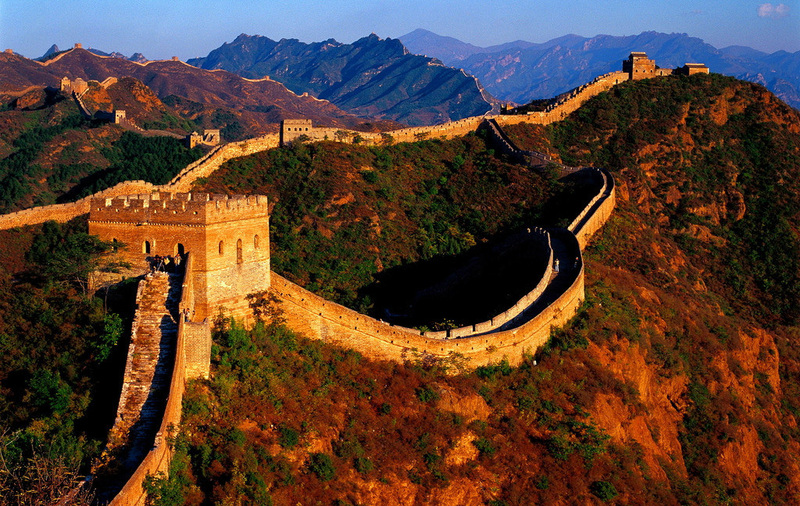 The building of the Great Wall started in the Spring and Autumn and Warring States Periods (7th to 8th century B.C.) in order to defend against northern nomads. 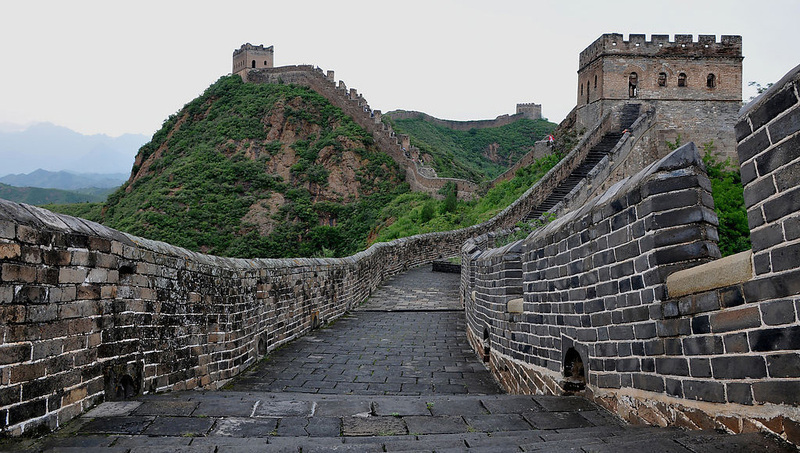 After the Qin Dynasty unified China, it linked the walls in Qin, Yan and Zhao states to try to ward off invasion by the Huns, The linked-up wall is known as the Great Wall. It was reinforced and extended again and again in the ensuing Han Dynasty, the Five Dynasties and the Sui Dynasty. By the Ming Dynasty, the Tartans and Waci and other minority nationalities that rose in the north often invaded the central area of China. So the Ming Dynasty built the wall for 18 times, linking the entire wall, 6,700 kilometers long from theJiayu Pass in the west to the Shanhai Pass in the east. Beijing is not only the political center of China, but also has been a city of strategic military importance. Through the narrow pass of the Yanshan Mountains, it is possible to reach the Northeast China Plain, the vast grassland ofMongolia and even the no-man’s land in the west. That is why all the feudal dynasties left Beijing with a solid Great Wall. Among the 629 kilometers of the Beijing Portion of the Great Wall, there are 827 watchtowers and 71 fortified passes, all well preserved. 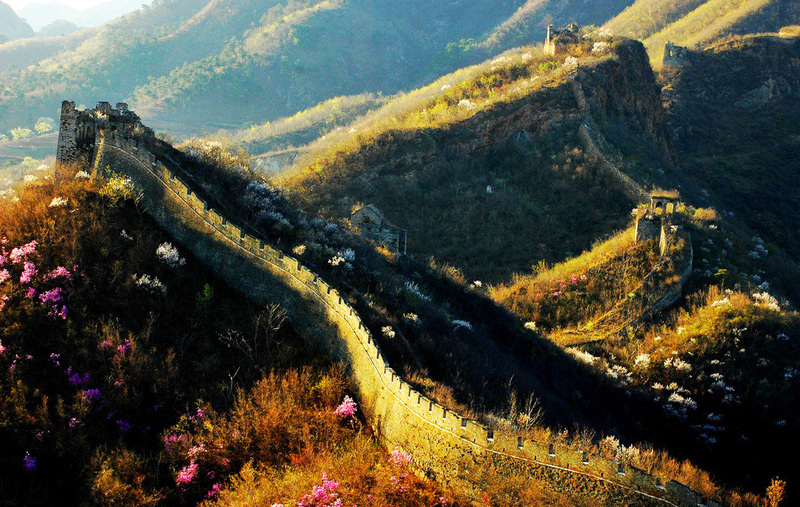 The Great Wall in the Beijing area has its particularities and also a section that is the best preserved. 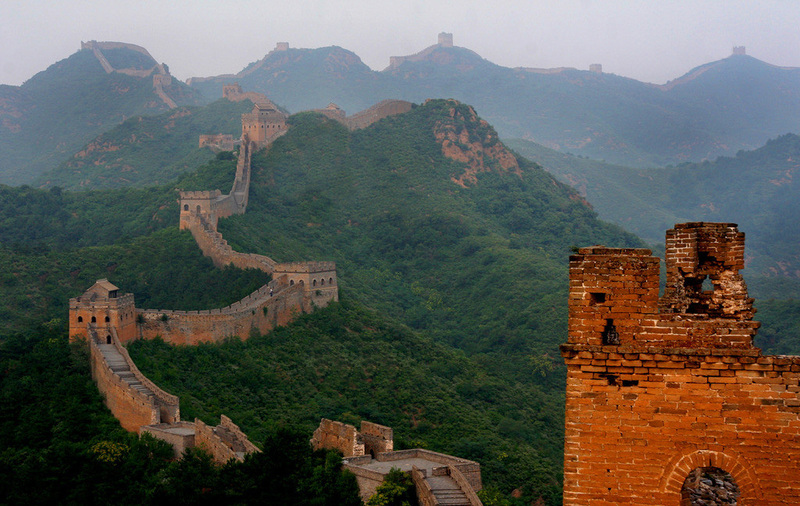 In 1987, UNESCO listed the Badaling section of the Great Wall in the catalog of World-famous Cultural Legacies. The Badaling is only an hour's drive along the Beijing-Changping Expressway. It is replete with tourist facilities. It is also very easy to get to the Mutianyu section of the Great Wall, taking only a little more than an hour by car. The landscapes along the way are also the most beautiful in Beijing. In the scenic areas, there are cable cars to reach the top. The Jinshanling section of the Great Wall is a bit far, and the mountain paths are dangerous. Tourist facilities are not complete, either. It is advised to go there in groups. If you want to see sunrise the next day, you may want to spend the night at farmer's houses, where the hosts are very hospitable. Badaling is hidden deep in the mountains north of Changping County inBeijing. This section of the Great Wall is the most representative, with its particularities. "Bada" in Chinese means thoroughfare, and "ling" means mountain ridge. It used to be an important strategic communications center and defensive outpost of ancient China. It provides a bird's-eye view of the surrounding area, with only one narrow pass and a small town. The Great Wall rises from the small town up the mountains to the ridge. The section of the Great Wall is 7.5 meters high on average, and the foundation is about 6.5 meters, narrowing up to about 5.8 meters on top, capable of allowing five mounted horsemen or 10 rows of soldiers to pass side by side. The wall has houses on the inner side and crenels on the outer side. Each crenel is about 1.7 meters high, with watch holes and shooting holes. At fairly close intervals, there is a fortified tower, usually on the mountain ridge or at wall corners or at the most strategic points. On the upper layer of the crenel, there are watch holes and shooting holes, and on the lower layer is the living area. The low ones are called wall platforms. Their height is similar to that of the Great Wall, but they protrude out of the wall, with crenels on all sides. It is a place for patrol. There are also some high platforms scattered along the wall. These are the watchtowers. In each tower were placed firewood, sulfur and nitrite. In emergencies, smoke was let off during the day. As wolf's dung was mixed, the smoke could raise up straight to the sky, hence the name "wolf smoke"; at night, a fire would be lit, called in Chinese "feng", or beacon fire. There is one watchtower or beacon tower every 12 li (six kilometers) along the Great Wall. Despite the distance, information about the enemy was passed on and reached the military command in hours. These towers formed a complete alarm system. Because of differences in temperature, each of the four seasons at Badaling is about two weeks later than in Beijing. Spring comes late, but in no time, the whole mountain turns green. In summer, despite the scorching sun, there are sometimes refreshing cool winds. 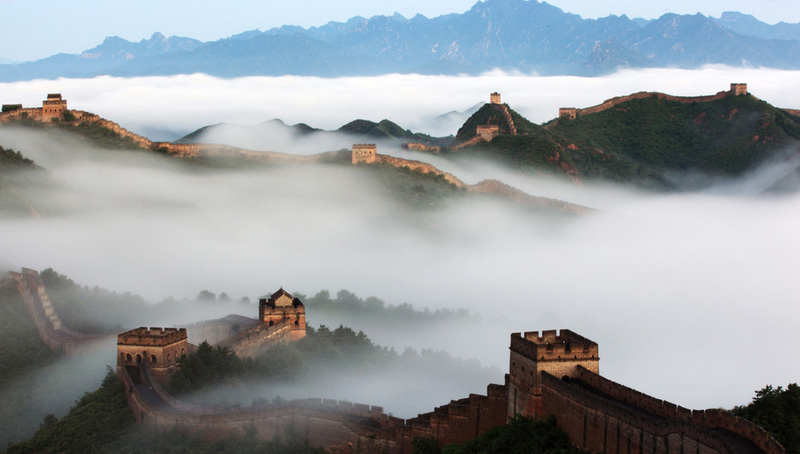 After a rain, the mountains are covered by veils of mist, making the Great Wall seem as if it were flying in the clouds, sometimes visible, sometimes not. In autumn, the sky is high, with few patches of clouds and winds becoming cooler. After a frost, the whole mountain turns red, covered with wild fruit and red leaves. When there is snow in winter, a typical view of north China comes into view. Juyongguan Pass is a major sight on a tour of the Great Wall. It is one of the nine narrow passes of the Great Wall, lying in the middle of a 20-kilometer gully. It connects the important city of Zhangjiakou in the north and Beijing in the south. Many fierce battles were fought in front of the Juyongguan Pass in the past. But today it has become a quiet place, with no traces of smell of gunpowder. There are only the magnificent small town and the Great Wall up the mountains. It quietly tells you that it used to be a battlefield in ancient times. Get to the top of the Great Wall and turn around, you will see mountains upon mountains, with flowers and green plants and trees in between. That is why, even in the Jin Dynasty, it was named by Emperor Zhang Zong as one of the top eight scenes of Beijing. In the Juyongguan Pass, there is a high platform built with marble called the "cloud platform". There used to be three stone pagodas on the top of the platform, build in the Yuan Dynasty. But they were burnt down at the beginning of the Ming Dynasty. Later on, a temple was built was built on the ruins, but it was burnt down again during the reign of Emperor Kang Xi of the Qing Dynasty. Now only the foundations can be seen. In the middle down the platform are an arched gate and an arched top to form a hexagonal structure. In the middle is the carving of a golden winged king of birds, flanked by a design of two crossed pestles and an elephant, a dragon, curled leaf flower and the god of python. The arched gates feature carving s of the four heavenly gods, which is rare in China. The Mutianyu portion of the Great Wall is located in the northern part of Huairou County. 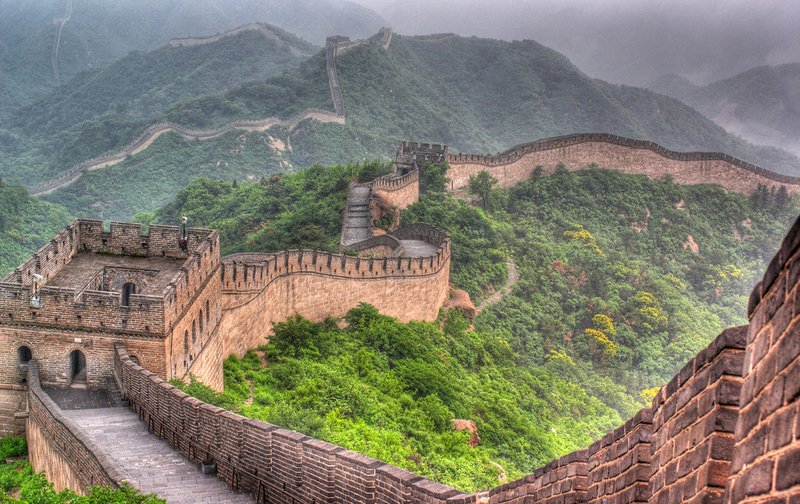 This portion of the Great Wall surveys a beautiful scene of rolling mountains and lush green woods. The narrowest part of Mutianyu is not very high, only 486 meters above sea level. But the confluence of three Walls in the southeast is built on a peak 603 meters above sea level. In the northwest, the terrain is steep, with the Great Wall built on a cut peak more than 1,000 meters above sea level. As it is like an eagle lying down, facing the sky, it is therefore called "a lying eagle lord". Mutianyu is an inevitable path to the inland areas. It was built in 1404, during the second year of the reign of Yong Le of the Ming Dynasty. On the platform of the central pass are three watchtowers, indicating its military importance of the pass. Novel in structure and exquisite in shape, the three towers standing on the same pass form a rare sight. Starting from the meeting point of three city walls, there are 14 buildings, each with its own structure and outer appearance. Such building groups can be seen only in that location around Beijing. In the Mutianyu area, grass and woods grow luxuriously, and there are many orchards, with a total green coverage of more than 80%, producing walnuts, chestnuts, almonds, sugar pears and haws. There are more than 20 trees, each more than 100 years old. The Simatai portion of the Great Wall is in Miyun County. Linked with it is the Jinshanling section. The terrain is of great strategic importance, with an open field of vision. This section is only 25 kilometers, but there are more than 14o watchtowers, almost one for every deep gully and mountaintop. It is unique of all sections of the Great Wall. The watchtowers are exquisitely designed, each with its own shape and regime. They include the warehouse tower, the large and small Gold Hill towers, the Beijing-looking tower and Fairy Tower. The narrow path leading up the Great Wall allows only one person to pass.